MultiBrief: Do active workstations benefit employees? Most of us engage in much less daily physical activity than our parents or grandparents did. Some individuals, such as office workers, students, educators and administrators, spend a great deal of the day seated, whether working, studying or in meetings. Over time, this can lead to serious health problems. Proponents of active workstations claim they promote increased physical activity throughout the day and improve wellness. Research, on the other hand, suggests the benefits can vary depending on the individual, the type of workstation and how it is used. Studies have shown that making changes to the design of the workplace or educational environment can motivate healthier behaviors and improve occupants’ physical and mental wellness. This can include rearranging the layout of equipment and locations to force individuals to walk more, prompting them to use stairs instead of elevators, and making available outdoor areas or nature views that lure them away from their desks. In recent years, another popular solution has been to provide various types of active workstations, which are designed to reduce the amount of time individuals remain seated and inactive during the day. Active workstations come in various types, such as standing desks, adjustable desks, pedal exercise desks, or treadmill desks. In addition, some types of passive workstations, such as open-bench seating, are less conducive to extended sedentary work, as opposed to a comfy, ergonomic office chair. To help ensure individuals use these devices properly and receive the maximum benefit, many employers also provide information, instructions, counseling, or training. Since these devices are relatively new, researchers have been interested in examining how in practice they affect individual’s health and behavior. A literature review of research on workplace interventions for reducing sitting at work found 34 such studies involving in total some 3,400 employees. Findings from these studies showed sit-stand desks reduced sitting times on average 100 minutes per day. Users also spent less time sitting for prolonged periods. Overall, the studies found no difference in use patterns or behaviors whether information or training was provided or not. Recent studies conducted in the workplace have produced mixed findings. A study conducted by the University of Arizona Institute on Place, Wellness and Performance found that workers in open-bench seating were more active at the office than those in private offices and cubicles. These workers reported lower perceived levels of stress at work and outside the office environment. Another study, led by Elizabeth Garland, associate professor in the Department of Environmental Medicine and Public Health at the Icahn School of Medicine at Mount Sinai in New York, showed workers using adjustable workstations were less sedentary and experienced less discomfort than those seated at traditional desks. Again, these subjects reported being more productive, experiencing less stress, having more energy, and feeling more positive outside the workplace. On the other hand, an intervention study undertaken at a Finnish software company concluded that that the usage of standing instead of sitting workstations results in only modest promotions of physical activity, does not have an effect on mental alertness, and actually tilts the stress-recovery balance towards stress. The researchers also found that the standing desk decreased musculoskeletal strain in the neck and shoulders, but increased it in the legs and feet. 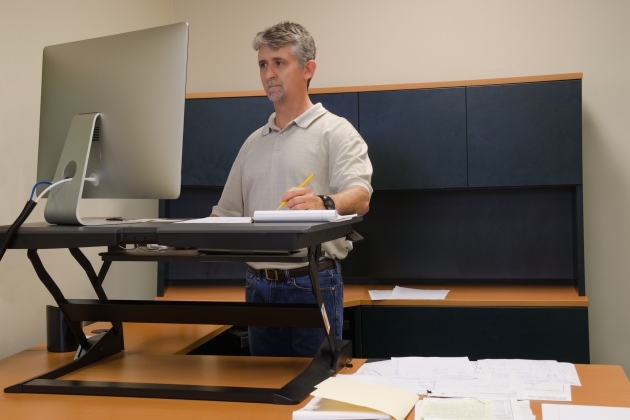 A team of Canadian researchers examined the suitability of two types of active workstations — a standing desk and a portable pedal exercise machine placed under a desk — in a university library environment. Both students and staff performed computer tasks and paperwork tasks using one of the workstations. Overall, the standing desk was considered more desirable and comfortable for most tasks. However, those at the standing desks were more likely to experience back pain after prolonged use. Subjects tended to prefer the pedal machine for paperwork tasks and the standing desk for computer tasks. Women, younger students, and those who sit for long periods of time (4 to 8 hours a day) preferred the pedal machine. A number of users described the pedal machine desk as effective, useful, convenient, and comfortable, even if their overall preference was for the standing desk. One of the concerns about active workstations is whether the physical activity involved disrupts or distracts workers, thus affecting their performance. The Canadian study found that some mechanical skills, such as typing, were negatively affected when using the pedal machine, but cognitive skills, such as reading comprehension, were not. Results of another literature review of seven studies on active workstations found no significant effect on productivity or performance. In general, researchers noted the need for more and better studies to resolve conflicting findings and ensure more reliable results. Nonetheless, these studies suggest that when used appropriately, active workstations do provide some health benefits and can be an effective intervention to combat sedentary behavior.